Kuba said: "No Alibis specializes in mysteries and American Studies publications. When I dropped by for the first time looking for a rare law book, I spent a few hours having a nice chat over tea with one of the booksellers. The place is rather small, but very cosy. Bookshelves cover all the walls and in the middle of the store there is a cute green table - just the place to put your mug of coffee while curling up and reading a book. The store is especially proud of its collection of signed editions and special events, including concerts, readings and meetings with authors." 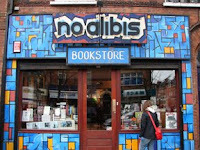 No Alibis is Northern Ireland's only specialist crime bookstore. They are based on Botanic Avenue, in the centre of Belfast, with a second store on the Jordanstown campus. They specialise in crime fiction and American studies publications. If you are looking for a novel, book or publication in the crime genre e.g. true life or fictional crime stories, thrillers, whodunits, mysteries, police and detective stories then then you have come to the correct place. If you are looking for American studies books, both factual and fiction, then No Alibis is the major clue in resolving your search. No Alibis has been around for 20 years and it's still rocking!! !